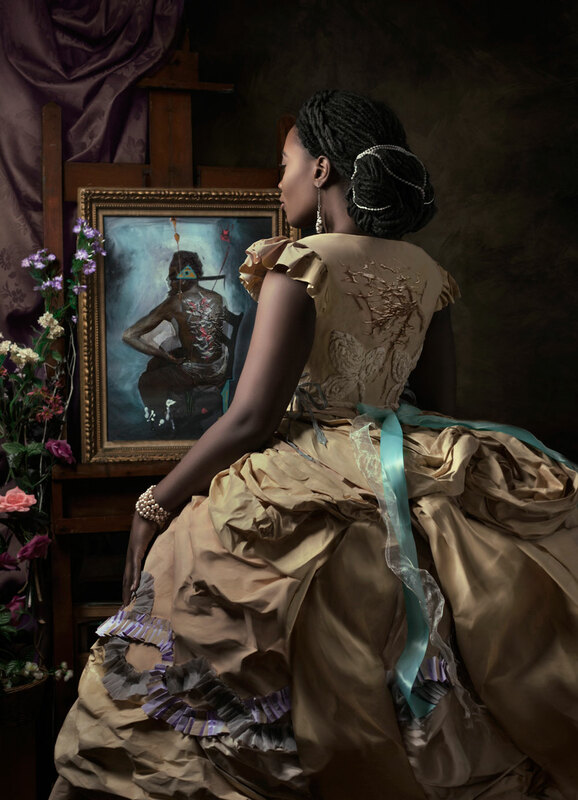 HSA and the Emerging & Teaching Artists of its Visual Arts Department are pleased to present Rewriting History: Paper Gowns and Photographs by Brooklyn-based Haitian artist Fabiola Jean-Louis. This collection of new and recent works will be her first solo show, featuring an installment of photography and display of 15-19th century inspired period paper gown sculptures from a master series currently in development. The exhibition will be on view through April 1st, free and open to the public. Fabiola Jean-Louis is a Haitian born, New York and Brooklyn raised, mixed media artist currently residing in Brooklyn. As a little girl growing up in New York, Fabiola was surrounded by art and fascinating characters. Scenes such as the gothic, punk, raver, and squatter all played a heavy role in her adolescent life. As a teenager, she studied fashion design & illustration at the High School of Fashion Industries, and attended the Art Institute of Pittsburgh. During her formal education Fabiola became disenchanted with the fashion industry, and left the field entirely. It would take 14 years before she discovered her talent in photography. While looking for inspiration, Jean-Louis remarked the absence of photographs that depicted Black mystical creatures, and Victorian women. It then became her goal to tell the stories of her ancestors, and express the influences of their contribution to American and European Histories, as well as preserve the beauty of her people through sculpture, fine art, and photography. Her work is informed by her Afro-Caribbean heritage, Black culture, and the dialogue of mysticism. For 50 years, Harlem School of the Arts has stood apart from the premier arts institutions in New York City as the sole provider of quality arts education in four different disciplines: Music, Dance, Theatre and Visual Arts. HSA enriches the lives of young people and their families in Harlem and the Greater New York City area by providing: unrivaled on-site arts instruction; vital outreach partnerships with New York City schools; quality performances and exhibitions that attract diverse audiences to its dynamic cultural arts facility; and prominent guest artists who actively engage the school’s community in the creative process through workshops and master classes. Through these enriching activities, HSA creates opportunities for both children and adults to fully experience the benefits that the arts can bring to their lives. For more information on Harlem School of the Arts courses, programs, and events, visit www.HSAnyc.org.